« Buena Vista’s History of High End Design. The holidays are fast approaching! Tis’ the season to send festive cards, spend time with loved ones, and make mad dashes to shopping malls. So grab your shopping list as we head over to some of the extinct, refurbished, and classic malls of South Florida. Miracle Mile was designed by real estate developer George E. Merrick and built in the 1950s. 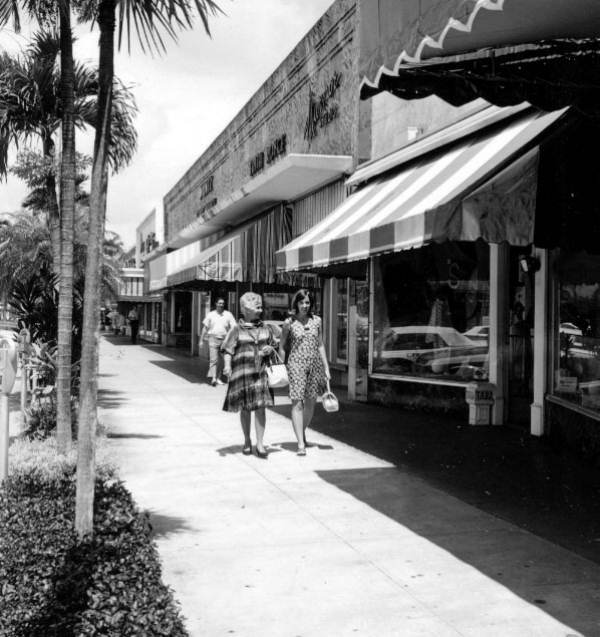 It was envisioned as a pedestrian shopping center located in Coral Gables between LeJeune Road, and Douglas Road. Merrick designed Miracle Mile so that every business in Coral Gables would be within less than a four-block radius. Today, Miracle Mile remains a popular business district and shopping destination. Photo coutesy of History Miami. “The Bakery Centre” was constructed on the site of a former Holsom Bakery. Because of the South Miami Metrorail station, the property at US1 and Red Road was thought to be an ideal location for a shopping complex. Developer and art collector Martin Margulies built the retail complex in 1980s. The structure was meant to serve as both a mall and an office space complex and was expected to create approximately 4,200 jobs within the community. 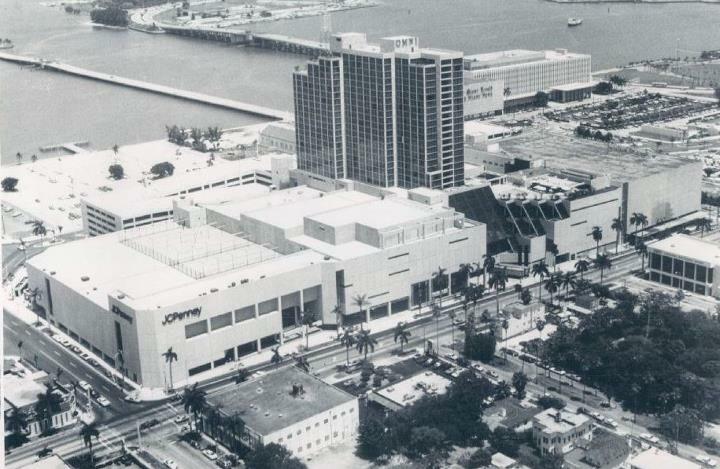 From the 1920s to the 1950s, the Omni area was a high-end shopping district with several major department stores located along Biscayne Boulevard. All of the buildings along the Biscayne corridor from NE 13th to NE 16th Street were designed and built by the Biscayne Boulevard Company in the Art Deco architectural style. One of the structures, the Sears and Roebuck Company’s Tower has now been incorporated into the design of the Adrianne Arsht Center for the Performing Arts. As the popularity of this shopping district grew so did the need for more retail space. In the mid 1970s Miami’s Tibor Hollow and Atlanta’s Maurice Alpert developed a suburban shopping complex named the Omni International Mall. The retail center opened in 1977 and replaced most of the high-end boutiques along Biscayne Boulevard. 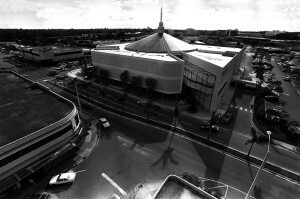 The interior of the shopping center contained a large atrium, a two story discothèque, a ten theatre megaplex, an arcade, and an ornate two story Italian carousel. The mall also featured chic retailers Emilio Pucci, Givenchy and Hermes. By the 1990s, the mall fell victim to urban blight. In 1991, major retailer Jordan Marsh closed and was replaced by Burdines which closed a year later. In 1998, JC Penney the last remaining major retailer at the Omni, also departed. In 2000, the shopping center closed, and the building was converted into offices in 2007. Today, the former mall retains a number of tenants including the Miami International University of Art and Design. It is also the location of the Greater Miami Chamber of Commerce. This entry was posted on Thursday, December 18th, 2014 at 9:40 pm and is filed under Coral Gables, Downtown Miami, Miami, Uncategorized. You can follow any responses to this entry through the RSS 2.0 feed. Both comments and pings are currently closed.